CALGARY, ALBERTA--(Marketwire - Sept. 7, 2012) - Qualex-Landmark announced today the launch of MARK on 10th, its downtown Calgary condos project in the emerging Design District. The first stage of the construction process is now underway as demolition crews start to dismantle the existing building (formerly West Canadian Graphics) at 10th Avenue and 8th Street SW. 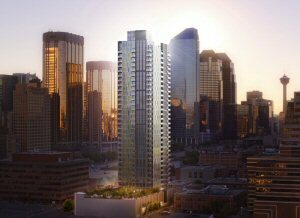 Details released today include the first look at the new building design, the downtown Calgary condos, a sneak peak at the superior range of amenities and new online registration program. MARK on 10th is contributing to the transformation of the Beltline with a distinctive 34-storey condo project offering homes designed specifically for Urban Calgary. "MARK on 10th is purpose built for today's urban dweller because of its proximity to the downtown Design District, offices, universities, transportation, and entertainment districts," says Roger Navabi, president, Qualex-Landmark, developers of MARK on 10th. "We are redefining the urban home by adding amazing amenities like the rooftop lounge and the generous 17,000 sq. ft. garden on the third floor podium into the mix." MARK is a mixed-use high-rise tower with downtown Calgary condos conceived by award-winning designers Rafii Architect in partnership with BKDI Architects Inc. and Durante-Kreuk Landscape Architects. Homes at MARK feature over height doors and ceilings, expansive windows, wide plank wood-laminate flooring, elegant porcelain tiles and individually controlled heating and cooling. The downtown Calgary condos will include building Calgary's best rooftop amenity with private members club, fitness studio and glass mezzanine lounge with 360° panoramic views of downtown and the surrounding mountains. Outside, an elevated hot tub, sunbathing patio with seating, lounge area with outdoor barbecue and raised fire pit complete the rooftop experience at MARK on 10th. With its location in the heart of Calgary's Design District, MARK has received a Walk Score® rating of 97%. WalkScore.com finds walk able places to live by measuring the walkability of any address. 97% is described as a walker's paradise where most daily errands do not require a car. MARK also places a special emphasis on infusing art into its common spaces. MARK's entry lobby will feature the unique artwork of one of Canada's most renowned visual artists. "We are excited to officially launch MARK on 10th," says Mohammed Esfahani, managing director, Qualex-Landmark, developers of MARK on 10th, "Home buyers can now learn more about MARK's amenities, its breath-taking views and its luxurious homes at accessible prices." The expansive 17,000 sq. ft. garden on the third floor podium is inspired by both traditional and contemporary landscape design from east and west. It will be one of the largest residential high-rise common gardens in the city.